2394 Believers in a 2D World Have Donated! 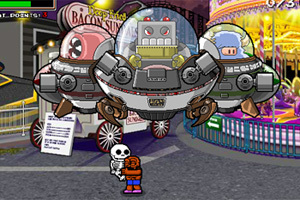 "Aboboy's Small Adventure" lets you control Aboboy as he follows his dad's example in the local amusement park. This downloadable game lets you continue the rage-a-licious adventure on your PC or Mac. This game is a FREE gift to everyone who makes a donation. It's our way of saying "thanks!" A: Because we're three indie developers who've been working on Abobo's Big Adventure for years as a true labor of love. We're not selling the game, we're giving it to everyone on the Internet to play for free. If you enjoyed playing it, please consider making a donation so we can pay our hospital bills due to all the beatings that Abobo has given us over the years. We'll put any leftovers towards developing another game in the future. Q: What's all this about getting a free mini-game? A: We wanted a special way of thanking everybody who donates to our indie cause, so we decided to make an exclusive, 100% original mini-game based on our "Aboboy" character called "Aboboy's Small Adventure". For anybody who is nice enough to make a donation, we will send you a free download link for this game. This free game will NOT be sold anywhere online and is exclusively for those of you who have made contributions. Q: So what's the story behind Aboboy's Small Adventure? A: Aboboy's Small Adventure is a 100% completely original (and FREE!) game by the team that brought you Abobo's Big Adventure. Much like his father, Aboboy is an incredibly strong force to be reckoned with, capable of destroying everything in his path. The only difference is, Aboboy doesn't realize he's destroying everything and everybody whenever he tries to hug them. So, the entire universe has decided to rebel against Aboboy to prevent him from breaking and killing everything in sight. Now it's up to you to help Aboboy survive against incredible odds! Q: I made a donation... now where do I find the Aboboy mini-game?